Spring is finally here! And that means the height of market season is just around the corner. This week, Countryside Conservancy helps us celebrate the turn for warmer weather and the fresh, Spring produce we’ve been waiting for all winter. Head on over to Instagram to follow how Countryside Conservancy markets bring farm-fresh food to the visitors of Ohio’s historic Cuyahoga Valley National Park! Farmers Market Coalition: Give us some history on Countryside Conservancy. Beth Knorr: Our market began in 2004, and we were the first market to be location within a National Park, nestled in the Cuyahoga Valley National Park! We serve farmers throughout Northeast Ohio, and feature over 75 vendors between our three market locations. One particularly inspiring story of our vendors is a young couple who, previous to competing in our Tomato Tasting and Salsa Smackdown, had never visited our market. They won the competition, and the following year launched their salsa business, and are now year round vendors with us. FMC: Tell us more about your markets. BK: We have two outdoor markets from May through October, and one indoor market from November through April. 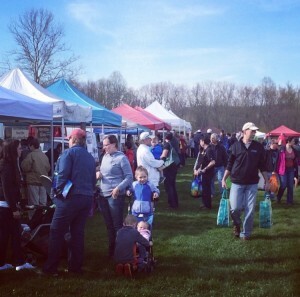 Our flagship market is at Howe Meadow, the special event site for Cuyahoga Valley National Park. It’s a large, family friendly event on Saturday mornings that regularly attracts 1500-2000 customers each week. Our second summer location is in the urban, highly walkable Highland Square neighborhood of Akron. It’s a smaller scale market that focus’ on the needs of the diverse community we serve. We welcome roughly 800 customers a week to our Highland Square location. Our indoor (winter) market is located at Old Trail School, an independent day school founded in 1920, whose curriculum is steeped in sustainability. There are about 750 customers who frequent each market during the gloomy days of an Ohio winter! FMC: What events or actives do your markets offer to draw in the community? BK: We have offered ranger-led hikes, yoga classes, trips to the farmers’ market via the Cuyahoga Valley Scenic Railroad, kids activities, cooking demonstrations, and a wonderful array of musicians. Our biggest market event is our Tomato Tasting and Salsa Smackdown, where we sample as many varieties of tomatoes as our vendors offer (usually upwards of 40+, in 2015, we had 75!). There is also a friendly salsa competition between area chefs and food enthusiasts on that day. FMC: How do you use social media to promote your markets? BK: Social media has really allowed us to engage with our audience more regularly. Particularly in the winter months, it enables us to showcase the amazing products our growers are bringing – which is often a pleasant surprise to newcomers to the market. Our biggest following is on Facebook, where we have a running list of our markets and other classes for backyard gardeners, home cooks, as well as farmers, but our Instagram following is quickly growing. I have to say, the CUESA Instagram feed has been particularly inspiring! FMC: What are you most excited about sharing with our followers? BK: I can’t wait to share the diversity of items our vendors bring to the market, as well as their enthusiasm. We have an amazing group of vendors (I know all managers say that, but it’s true!) We’ll also be partnering with another local non-profit on our final Instagram day with FMC, and I’m excited to showcase how working together can benefit so many independent businesses! Join the conversation! Follow FMC on Instagram!